The Iowa harvest is finally in full swing after being delayed a few weeks by rainy weather and muddy fields, but that delay is raising fears among conservationists that many farmers may skip planting cover crops this season. Mahaska County farmer Michael Jackson says he’s already nearly two full weeks behind on harvesting. “We usually strive to be done with corn by Halloween,” Jackson says, “and with a little bit of luck we’ll be done with soybeans by Halloween.” Getting his cereal rye seed in the ground for cover is two weeks late, too. Still, Jackson says he sees the soil health and water quality benefits from cover crops, though many other farmers aren’t convinced. Alan Lange with the Natural Resources Conservation Service, worries the late harvest may be one more discouraging factor. “That is a possibility,” Lang says. “In a season of late harvest, cover crop just makes another management requirement for a farmer. So, it’s something else that they have to try to manage this time of year that’s so busy.” Cover crops are important, according to Jackson, who says slowing erosion is worth the extra effort. 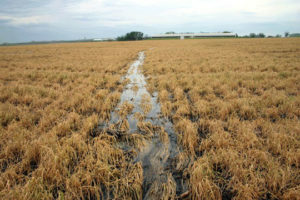 “We do have quite a few terraces, quite a few grassy waterways and that really shows up right there,” Jackson says, “because you’re not out there every winter cleaning those waterways out or cleaning a terrace out.” Research shows cover crops can keep soil and nutrients on the land and out of waterways, but many farmers don’t plant them, citing added costs. A report finds less than 3% of Iowa’s farmland has cover crops.